Not long ago the National Automobile Dealers Association (NADA) made a video to tell consumers how "misguided" there were to think that Tesla's direct sales model was that better than the franchise model. Now the NADA wants to tell you how wonderful it is to negotiate your car deal. 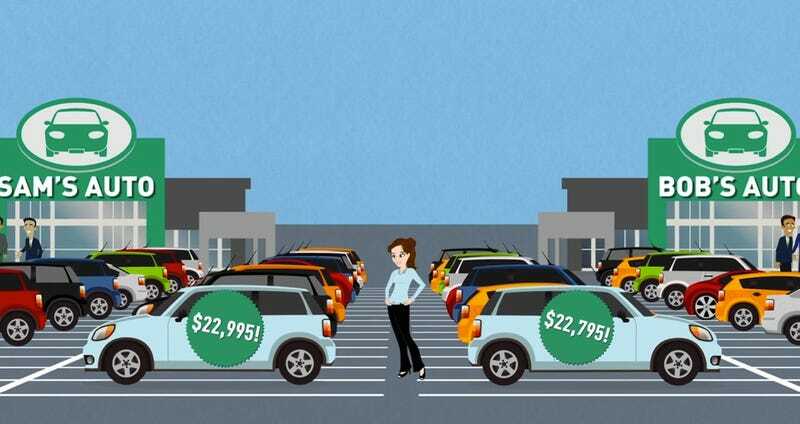 This video highlights the "benefits of price competition" and tries to prove the point that negotiating to buy a car is so easy and stress free for the consumer that dealers really aren't making much money. The NADA is clearly responding to a recent Edmund's ad that shows the ridiculousness of haggling for items in your grocery store. Of course since Edmunds makes their money from dealerships, they pulled the ad. But conversation continued, despite Edmunds saying that their video"portrays a buying experience so far from the way modern dealerships operate," most viewers thought the grocery store clerk had an uncanny resemblance to how their dealership acted the last time they bought a car. So the NADA video does get a few things right, primarily that dealers don't make much money on new car sales and that dealership competition and online pricing tools have made margins slim. It also addresses the fact that profit margins on other items like furniture are way higher than automobiles. Here is what the video conveniently glosses over, while online shopping and multiple dealerships within the same area should result in a competitive buying experience that favors the consumer, often times this is not the case. In large metro areas, often dealers have numbers to their advantage and won't waste their time with savvy internet shoppers when they have hundreds of suckers that walk through the door. Also, while dealers aren't making much on the sale of the vehicle some of them are finding ways to make that money on the "back end" of the deal. The reality is despite all the resources the internet gives car shoppers, most of them still feel like they are being taken for a ride every time they buy a car. Most people despise the process. This is precisely why third party web-sites like TrueCar and Edmund's Price Promise are gaining popularity, because they promise a "transparent" car buying process. But despite these tools the vast majority of buyers want to buy a car like they buy an iPad. They want a choice between purchasing from the factory or from a franchised store, and consumers know that the dealerships are standing in their way from doing this.